Gunship 2011-09-20. An old and much modified vessel, but little is known of its history. Bristlecone was approximately six hundred years old when it entered the story. 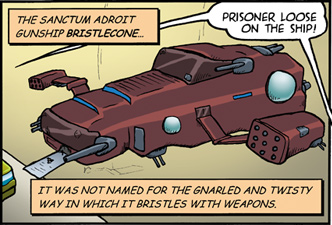 The ship was teraport-equipped, but until it was acquired by the Toughs, it had only been used in the Celeschul system. The AI has the quirk of tracking the genealogy and progeny of everyone that has ever traveled within its hull (which Para Ventura refers to as "number 98 in the Ferro-Swedin catalog") 2011-10-30. Bristlecone was heavily damaged by the Oafan station Eina-afa. The Toughs wrote off the ship, but transferred the AI into a cargo hauler which they named Cindercone.